Weekend pass (includes on-site tent camping) $130 in advance or $150 at gate; limited cabin bunks available for an additional charge; single-day tickets also available. The fest will feature forty-one bands across three stages during the three nights. Thursday performers will include North Dakota’s Ghost Bath and Canada’s Numenorean, who are on tour together, as well as German duo Mantar (on an off day from their fall tour with Cobalt). Friday will feature Brooklyn’s Tombs and a very special reunion of Philadelphian two-piece Sadgiqacea, plus an appearance by Mongolian folk metal band Tengger Cavalry, who are also in the midst of a U.S. tour. 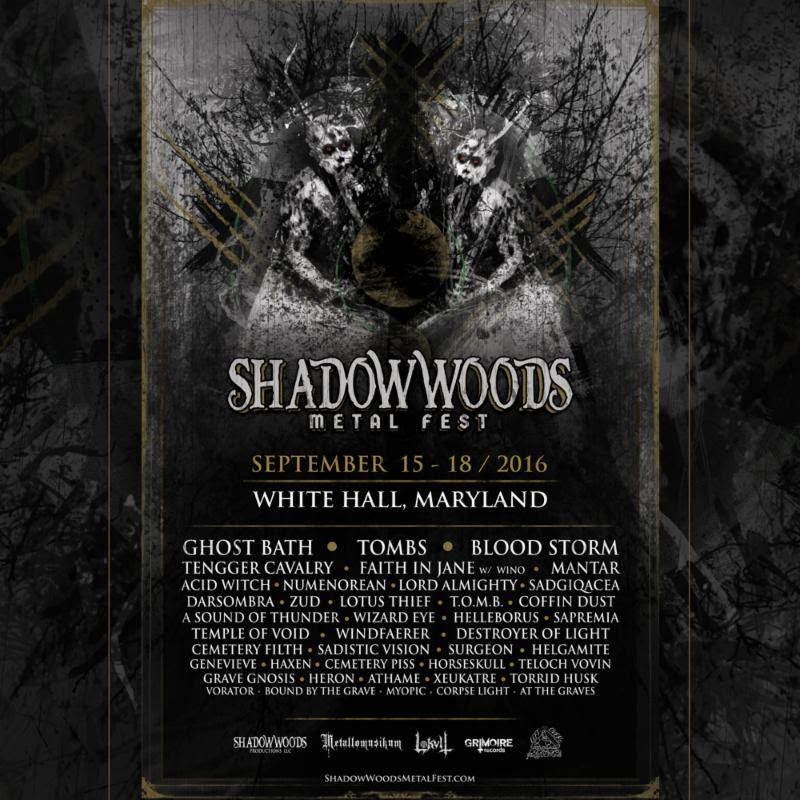 One of Saturday’s highlights will be Faith in Jane featuring the legendary Scott “Wino” Weinrich, as well as a handful of bands from local Maryland label Grimoire Records, who are one of the festival’s partners and co-producers. This entry was posted in Shows, Videos and tagged A Sound of Thunder, Acid Witch, At the Graves, Athame, Blood Storm, Bound by the Grave, Camp Hidden Valley, Cemetery Filth, Cemetery Piss, Coffin Dust, Corpse Light, Darsombra, Destroyer of Light, Empyreus, Faith in Jane, Genevieve, Ghost Bath, Grave Gnosis, Haxen, Helgamite, Helleborus, Heron, Horseskull, Lotus Thief, Mantar, Maryland, Myopic, Numenorean, Sadgiqacea, Sadistic Vision, Sapremia, Shadow Woods Metal Fest, Surgeon, T.O.M.B., Teloch Vovin, Temple of Void, Tengger Cavalry, Tombs, Torrid Husk, USA, White Hall, Windfaerer, Wino, Wizard Eye, Xeukatre, Zud. Bookmark the permalink.